View More In Traditional & Cultural Wear - Page 6. 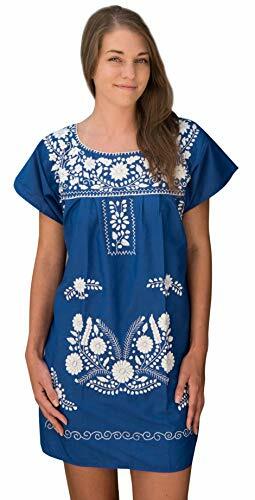 A shorter version of the popular embroidered Mexican peasant dress. Each dress is hand embroidered and is one of a kind. Bright colorful flower embroidery on a light cotton dress. Great with heels for a night out on the town or to wear to the beach with your favorite sandals. You are sure to turn heads wherever you go with this stunning dress. Each dress is handmade and as such variations in patterns and color of embroidery will occur. Please note these are mini dresses and are meant to fit mid-thigh. To avoid the hassle of returns and restocking/cleaning fee, please carefully choose your size as measurements are a bit different than standard US sizes. THE 2X SIZE FITS SMALL. Machine washable soft cotton fabric. Great for warm summer days and nights. Versatile dress can be used as a beach coverup or paired with heels for a night out. All hand embroidered in Mexico with colorful floral embroidery. Each dress is one of a kind so variation in color and pattern of embroidery will occur. If you have any questions about this product by Liliana Cruz, contact us by completing and submitting the form below. If you are looking for a specif part number, please include it with your message. © 2019 - toadlilypress.com. All Rights Reserved.